Wo r k s h o p L A K E G A R D A, I T A L Y 2016 !! "Thanks for your guidance and advice... in my first experience with landscape painting. I was able to take away from both (IC) workshops the ability to set up and complete a painting faster than I've been able to before. "The workshop was a wonderful experience. Ci vediamo." "The exposure to you and your work, was the best birthday gift I could have given myself." "What a fabulous workshop in Tuscany. As always, you are a kind, patient, encouraging, and talented artist and teacher. You are so much fun to be with. "I am very blessed to have you in my life and look forward to our next workshop." "Thank you! I really don't think I would have had my epiphany in Tuscany if I had not felt your unconditional support for my artistic attempts. Thanks again for everything, Kit. You are a gift to those of us daring to share our souls in our paintings." "You are a great teacher, Kit, and a NICE person. The world needs more teachers like you... Keep up the great work." "Thank you! I really don't think I would have had my epiphany in Tuscany if I had not felt your unconditional support for my artistic attempts. Without that cushion, I would not have dared to be so bold and free. And I have not known such joy as when painting outside with lots of paint and spontaneous strokes of the palette knife. "Thanks again for everything Kit, you are a gift to those of us daring to share our souls in our paintings." "You are an amazing instructor. I already knew that. I learned so much in Tuscany that I came home enthused and inspired to unpack my gear and start painting. The overall experience was amazing. "I anticipate future opportunities to learn from you, because it makes me happy to be in the presence of your positive energy and tutelage." "It was a wonderful group of painters... each one bringing their own unique experience and style. Not only were the Tuscan landscapes amazing, our accommodations couldn't have been more perfect. Such a great learning (and fun) atmosphere! "Grazie!! for an amazing and memorable painting experience! "PS Did we decide if the birds sing in Italiano? :-) "
- Camille M., El Dorado Hills, CA. Who but you would work so hard to: put us in the right place for multiple grand plein air compositions; let us know there is more than one way to achieve good results; get down in the tray to show how different color mixtures give desired results; get around to all the easels more than once each half-day, giving encouragement and support? Great leadership, teaching and fun-making! "It was a great week for me. Challenging but fun. I really enjoyed spending time with you and meeting new friends. You are so supportive, but also very good at giving every student constructive criticism. I am in awe of your sensitivity and patience. I learned so much in those five days. Just wish my college professors had been as instructive. I never remember watching a single demonstration of how they individually worked. It was also wonderful to spend time enjoying Tahoe. After 22 years, 3 of the places we went to, I had never seen before. Even Sand Harbor took on a new character as I watched it carefully for so many hours." Mille grazie for all the attention to detail that went into making this workshop so very worthwhile. Michael and I benefited greatly from your skillful and subtle instruction. I feel so much better about my efforts after just five days....I hardly know what to say! I will go with my first instincts and just thank you. I look forward to spending another five days in September at the Miracle Workshop to hone my new skills and learn something new. I am sitting in my meadow and I am painting away.....when the picture starts to get away from me.....and I remembered some things you said and now it is saved AND done! Thanks for that and all the other things I learned!" "Well, it was a most wonderful workshop!! Nice variety of places, great people and excellent painting help from you. I loved the friendly and casual atmosphere. Thank you so much for your always generous self, delicious lunch and your expertise as our picture-painting trouble-shooter. You created an all 'round terrific experience. 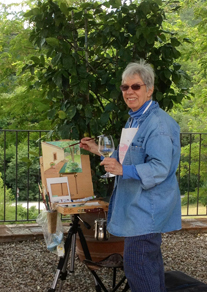 Everything about the time spent in your plein air workshop was wonderful! I will look forward to working with you again, because one can see a progress with such intense focus. It has always been much too easy to put my painting on the back burner. Hope you realize what a gifted teacher you are!!!!! "I had a wonderful week in your plein air work shop. Looking forward to doing it again! I have all of my paintings strung out in front of me. Not bad! I'm happy!!" "I had such an awesome time at the workshop! Kit creates a supportive and fun painting environment with great insight into every painting. She offers help and guidance with focused and detailed attention for every skill level. Having time to do nothing but paint is a luxury in itself - being able to paint with Kit in your corner is a privilege." "I got a lot from the workshop, in all sorts of ways. First, just getting out there with all the equipment, among the public. I'd expected that to be distracting and a little intimidating. Didn't really notice them. I appreciate, again, the atmosphere that you establish. I think we all felt very comfortable in taking on the challenges before us each day. Input when needed, and affirmation. In the last couple of days while walking the dogs, I have found myself mentally mixing greens to match the colors of the foliage. I'm reminded of what Mark Twain said about golf, something about a nice walk spoiled. But I like golf. And I like that I'm anxious to get back to the palette. So, yeah!" "I still have a lovely glow of camaraderie and... well, the glow might be Cad Yellow! But I'm convinced that painting produces as many endorphins as exercise...I had a blast! "Thanks again for everything you did for us during those days. Looking forward to a future workshop! Fondly,"
"Just a note to thank you, again, for the marvelous workshop. This was my second tour with you and it was just as enjoyable and educational as the first time around. Your enthusiasm, talent and nonjudgmental approach make for a great three days of painting and learning. Thanks". "I have been to many workshops, but I found yours to be the most inspiring. I believe this is due to your positive criticism, if I can call it criticism. Your positive feedback made all of us want to try harder. I think I might have even loosened up a little. I loved that you did not spend too much time doing demos. I always want to try it myself. As you came around and showed me how to create brush strokes or color, I was able to see how you do it. This has helped. "I also think it is great that you hold the class to a limited number of people so that we all benefit from your personal touch. The number of hours were perfect. In fact, the day flew by. At the end of the workshop I did not feel beat up. I left feeling like I wanted to paint more!" "You are a great teacher and gave me much of value to work with in the weeks and months ahead. "Secondly, you attract to yourself wonderful and talented persons, so I had the opportunity to be with them and learn in a fun environment. "Most impressively, you come so well prepared and spend enormous time and energy. This enhances the experience immeasurably and makes the workshop so worthwhile." "Thank You! I learned so much from you and you helped me remember the joy of painting. I am very grateful for that. I am really looking forward to taking another class soon. You have a wonderful creative spirit that was a joy to be with." "Kit, I had a wonderful time at your workshop. I learned a ton of things. Also, I thoroughly enjoyed your teaching style. You give constructive criticism in a very supportive and encouraging way. I wish I could think of another word instead of "criticism." It's more that you share your sense of color or composition, and we can either choose to take your suggestions or stick with what we're doing. "Clearly, you are a very experienced teacher and it was a great workshop. Can't wait to do it again! The hours just flew by. I wasn't even tired at night. Instead I found myself thinking about all the things I'd learned during the workshop. Loved it." Plein air oil painting workshop with Kit Night. My workshop this spring in Tuscany was such a blast - successful beyond my highest hopes - we are doing it again! 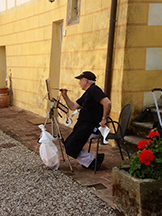 This time, come paint with me among the gently rolling hillsides of the Crete-Senese region of Tuscany, just southeast of Siena. Tall cypress, poppies perhaps, with lots of beauty to paint right on site at our villa. An easy walk into the quiet village provides more quaint Tuscan scenes or a cappuccino. Our home base is an intimate, elegant villa, in San Giovanni d'Asso. 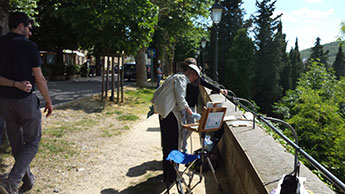 Enjoy daily plein air classes with me, with occasional excursions to another village to sight-see, paint, or sketch. With beauty right at hand, there is plenty of time to paint each day. Our mission is painting, learning, enjoying! Long morning sessions will be focused painting time with plenty of one-on-one instruction, and occasional short personal demos to zero-in on a particular concept. I am an animated, articulate, supportive instructor. Afternoons are optional painting time, with input from me as desired. Or, relax, read, go for an evening stroll. End of painting day brings informal group critiques - a fun, supportive opportunity to learn from our peers. 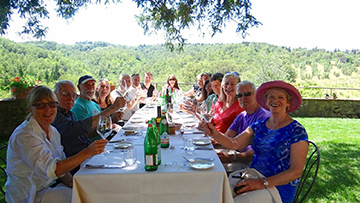 Evenings, we enjoy lively conversation and hearty varietal wines over the delicious multi-course dinners Tuscany is famous for - prepared by our personal chef! Pickup at Florence train station at 3:30 on June 6. Shared double room with private bath in our villa. Transfer to train station in Chiusi on June 13, for connections to Rome or Florence. Airfare / Art Supplies / Lunches, Independent meals and independent sight-seeing. As always, class size is limited. Don't wait too long to decide. Happily, my classes fill quite quickly! Last year we had a wait-list. Please join others in signing up early to save your spot. Tutti Anticipazione is part of the fun!